This is part of a series of interviews with inspiring travelers. 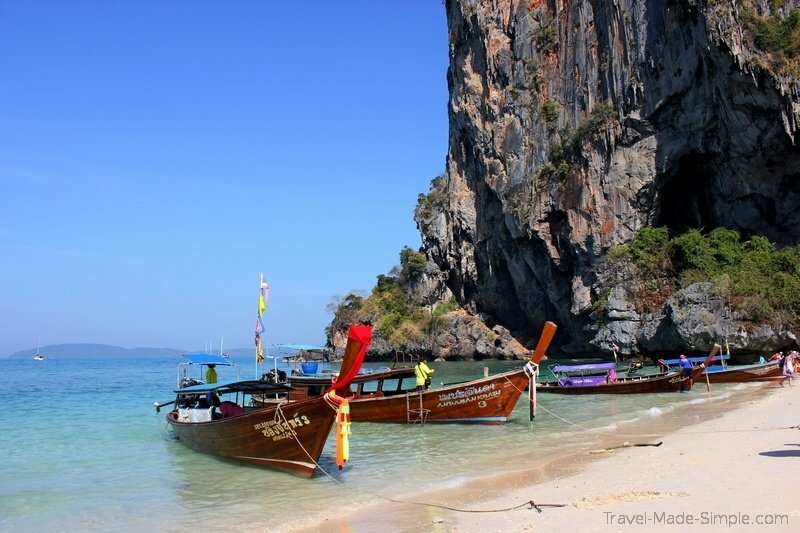 Today I’m interviewing myself about the Krabi 4 Islands Tour. See more about tours and tour reviews here. I’m Ali, owner of Travel Made Simple. I made it to all 7 continents before my 30th birthday, and some of my favorite countries include Italy, Turkey, Australia, and Thailand. I’m originally from the US, but now I live in Berlin. You can read more about me here. Where did you go on your tour and how long was it? 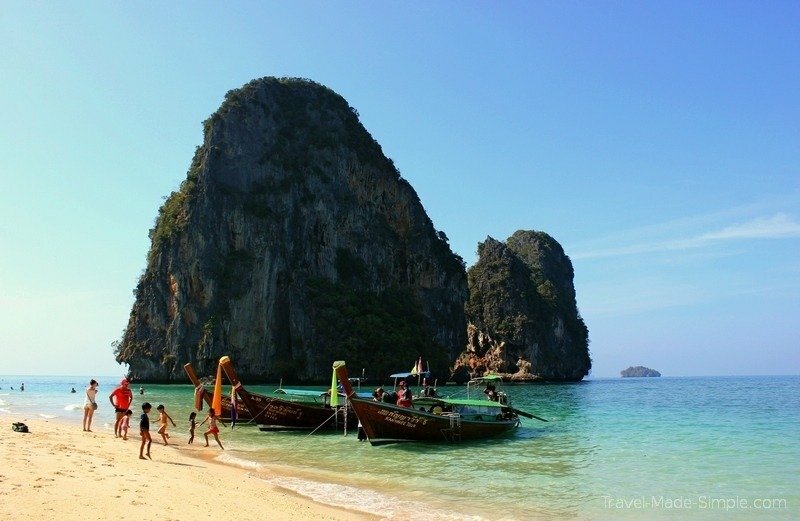 My husband and I took the 4 Islands Tour from Ao Nang, Thailand, though we were picked up from our guesthouse in nearby Krabi Town. The tour lasted about 8 or 9 hours, from early morning to late afternoon. I honestly don’t remember the name of the company because we booked it at the last minute while we were there. We saw two or three companies running these tours, and they all seemed to follow the same route, so I don’t think there’s a major difference. Since this was a boat tour to visit tiny islands off the coast of Thailand, I don’t think there’s any way we could’ve done this on our own. From the pictures we saw, the islands looked gorgeous, so paying for a tour was the obvious answer, and I’m so glad we went! What did you like about the 4 Islands Tour? What was your favorite part? The tour was all about the beautiful scenery, and it was amazing! I couldn’t stop taking pictures of the crystal clear water, the colorful longtail boats, and the lush, tropical islands. A few of the islands they took us to weren’t anything special themselves, but they had views of other really pretty islands and rock formations sticking out of the sea. My favorite was probably Poda Island because of the views. What was the most memorable or eventful part of your tour? The fish! There were tons of fish swimming around, mostly striped ones. (Sorry, I have no idea what kind of fish they were.) We stopped near Chicken Island to go snorkeling, and I loved seeing the fish swimming around there. While we were on another island, a couple in our group pulled out a loaf of bread they brought along and started feeding the fish. Several of us were standing about knee deep in the water with hundreds of little fish swarming around us and eating bread crumbs (and perhaps occasionally nibbling on our toes) and it was amazing! The lunch they provided us wasn’t very good, but it wasn’t terrible. There was a meat and a vegetarian option, plus they gave us water and fruit. So you won’t go hungry, but just keep in mind this isn’t a culinary tour. Did you eat anything amazing on your tour? No, see above. The best thing I ate on this tour was the pineapple and watermelon slices they gave us towards the end of the day. 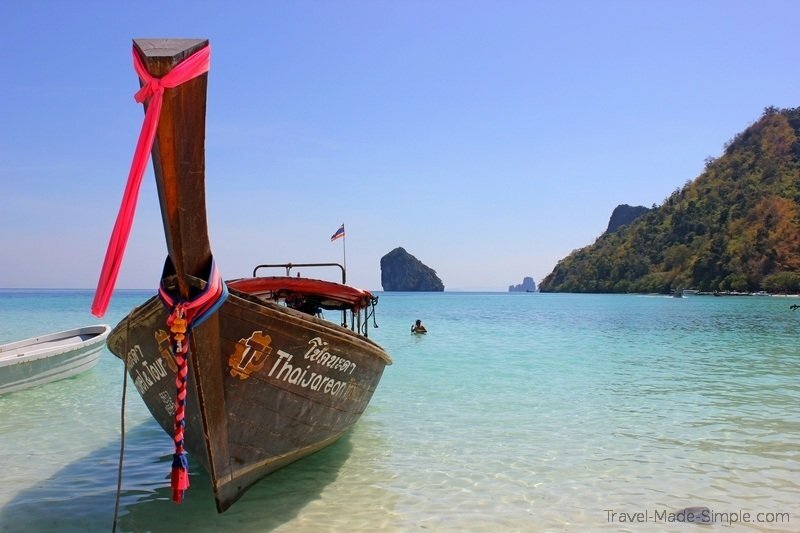 What inspired you to take the 4 Islands Tour or travel to Thailand? Thailand is one of those countries people just rave about. It’s beautiful, it’s cheap, the food is delicious, the people are friendly…so I wanted to travel there for years. I had seen so many gorgeous pictures of Thailand, so when we were backpacking in Southeast Asia, going to Thailand was an easy decision. 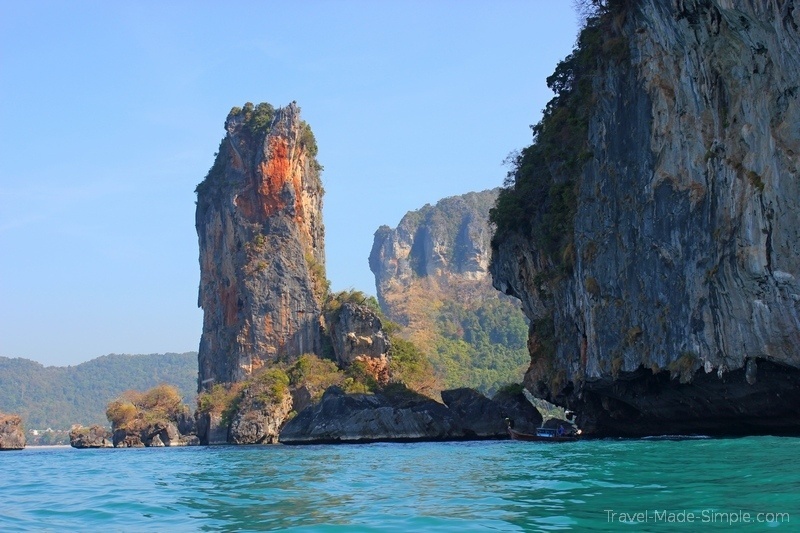 There are tons of islands in the Andaman Sea, and taking a day tour seemed like a great way to experience the area. Would you recommend the 4 Islands Tour? Would you change anything about it? Definitely! It was a really fun tour. I wish the lunch was better, but you’re not there for the food. Bring some snacks that don’t require refrigeration. Do you think this tour would be good for a new traveler? Why or why not? Yes. The tour company picks up from most guesthouses and hotels, brings you to the starting point, and drops you off again at the end, so everything is taken care of for you. It was a fun way to see some of what southern Thailand is known for. And you get to spend a relaxing day playing in the water and gushing at the scenery. Definitely a good tour for new travelers. 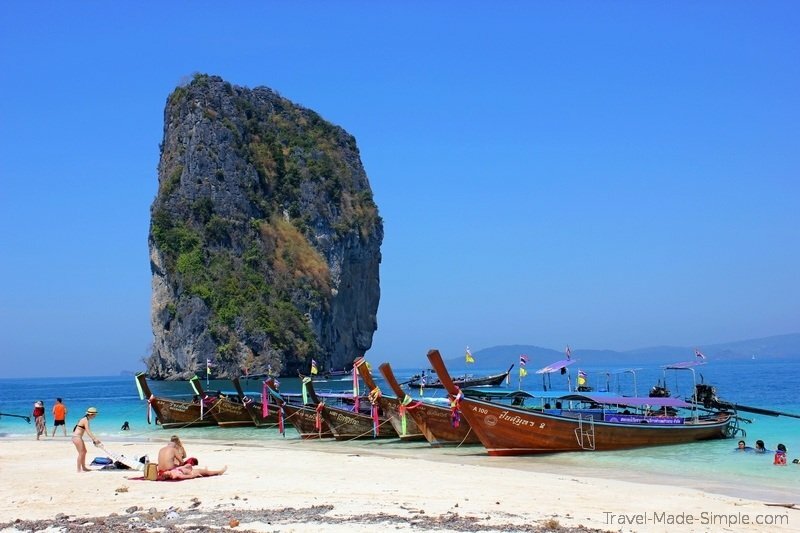 Interested in taking the Krabi, Thailand 4 Islands Tour? Click here to book your tour ahead of time!